Somehow or other I managed to get through my undergraduate degree and two graduate degrees without ever taking a course in Chaucer. And that was in the the mid to late '60s, when he was pretty much standard. It's a shame because I rather like Chaucer, and I might have enjoyed the class. People frequently use the phrase old English to mean either unusual or uncommon spellings, or some obsolete word form, such as thee, or thou. In reality the history of English is more complex than that, and the notion that Shakespeare needs translation for a modern audience simply shows not the growth of the English language, but the decline of intellectual curiosity and the incapacity of modern teachers. 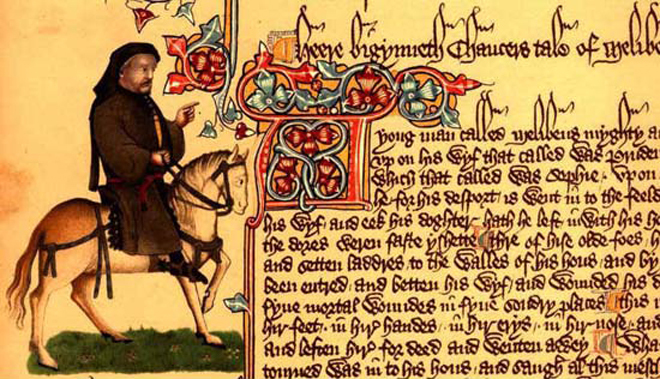 Chaucer wrote in Middle English, not Old English, or more accurately Anglo-Saxon, and while his poetry and prose does need a gloss, which can be adequately provided by footnotes on the page, his grammar is not that unusual. Certain words are pronounced somewhat differently, for example, the k in knight was sounded, and final e was not always silent. The language shows the influence of Norman French, which came in with William the Conqueror. Richard II , in which he delivers the famous speech extolling glories of Britain. ‘But wherfor that I telle my tale? The speaker identifies his wife with the totality of his emotional life ( My suffisaunce, my lust , and of his physical well being ( myn hele ). Note though that emotional and physical terms appear to be intermingled. Chaucer conveys the welter of emotions that the speaker is feeling by tossing in the vocabulary of both emotional and physical life in an apparently unordered manner. This is early Chaucer, his next book, The House of Fame is a more mature work. The House of Fame 347.—Like the previous poem this is a dream story. In this one Chaucer visits the House of Fame, an allegorical representation of both good and ill fame. The interested reader can consult the various online resources for an outline of the poem. What is notable about the poem is the extent to which it represents an advance upon the Book of the Duchess . Anelida and Arcite 375.—This is Chaucer's most structurally complex poem.